The soils in the Catskills are mostly acidic; in the Finger Lakes, soils are more basic. In the Hudson Mohawk River corridor, some areas have much sand. Soil pH determines the plants that grow there, and therefore the butterflies. For example, Brown Elfins feed as caterpillars on blueberries (Vaccinium) in acid-soil regions; ’Olive’ Juniper Hairstreaks on red cedar (Juniperus virginiana) in limy areas. The Adirondack Mountains also host distinct species and tourists in the area might want to check out the Breck Chapin Memorial Native Species Butterfly House. It hosts the approximately sixty native moth butterfly species. It’s also a great way to get multiple pictures in one fun filled afternoon. Down south, especially in the warmer metropolitan areas butterfly species are different. The New York Botanical Garden cites the following list as common butterflies in New York City. Apart from the common, New York City also hosts the uncommon butterfly species. In fact, according to a recent survey by the New York City Butterfly Club about one hundred and twenty different species can be found within a fifty mile radius of the city. Butterflies abound in all five boroughs. Join them as they take the shoe leather express through the parks in search of these denizens of the Big Apple. Visitors need only check out one of four butterfly gardens in Central Park to get a taste of the action. The Red-spotted Purple or White Admiral Admiral, pictured at the top of the page, was recently designated the state’s official butterfly. Welcome to the world of New York butterflies. This introduction to New York butterflies provides a list of the species documented in the state. Visitors looking for more butterfly pictures and identification help can press the green butterfly button for more information. Pieridae butterflies are the ones with white wings and yellow wings. New York has an average number of species. 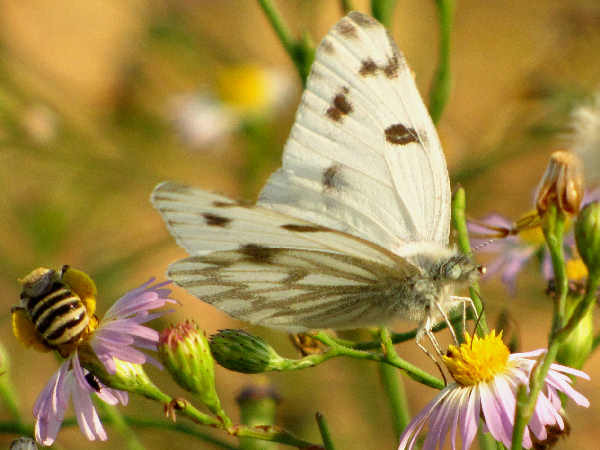 The picture shows a Checkered White butterfly. Most poeople will recognize the Cabbage White because it lives in every residential neighborhood in the state that hosts back yard gardens. Their caterpillars feed on plants in the cabbage family, very popular back yard garden vegetables. 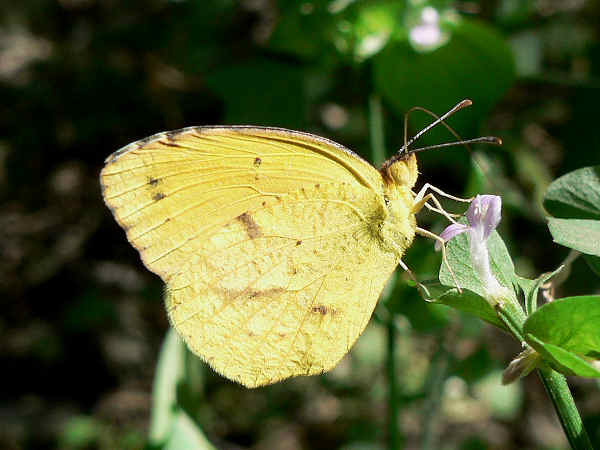 Little Yellows and Dainty Sulphurs will be the smallest of the yellow butterflies in the state. Most of the sulphurs look very similar with the Clouded and the Cloudless being the most common species. The picture shows a Sleepy Orange butterfly. It’s a southern species that can be found occasionally in New York. Most of the Gossamar Wing butterflies are not city dwellers, due partially to the fact that cities don’t often have plants that serve as larval hosts. 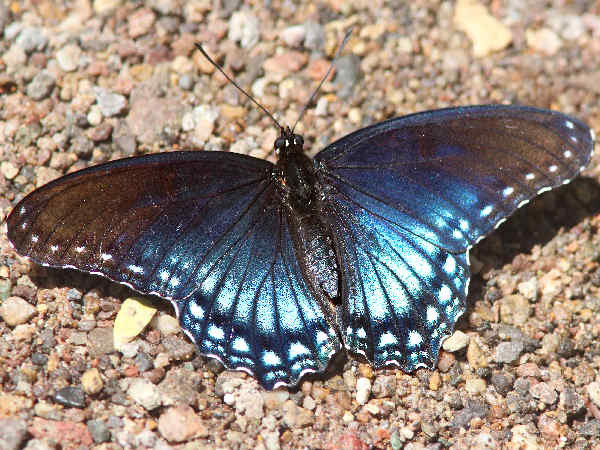 The list of New York’s blue butterflies reads about the same as other Atlantic coastal states. 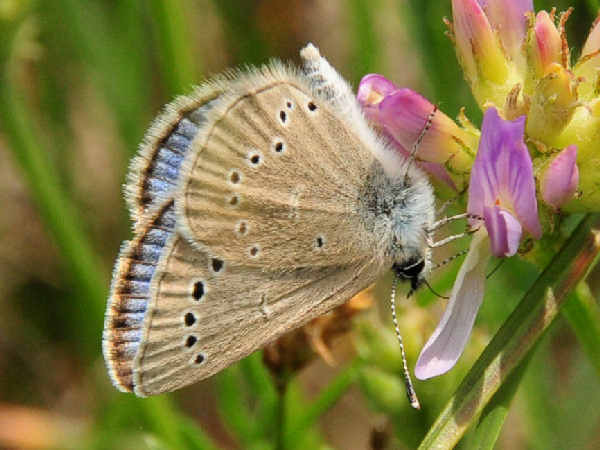 A small population of the endangered Karner’s Blue (Melissa Blue) has been documented in the Hudson River area. Tailed-blues and Azures have larvae with very flexible eating habits, so they are the most common species in the state. It’s often, but not always easier to find many of the following species, especially the copper butterflies in the fields, forests and mountains of New York. The picture shows a Silvery Blue Butterfly. 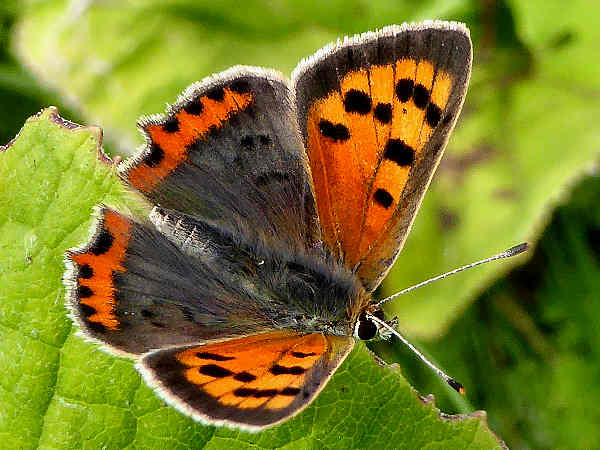 The picture shows an American Copper butterfly. A look down the list of New York Brush Footed butterflies reads like a plant menu. It’s a testament to the dietary habits of butterfly larvae and the common wildflowers of the East Coast that so many of the New York Brush Footed butterflies can be found as far south as Florida and South Texas. Monarchs, Fritillaries Emperors and Ladies all fit this pattern. Fritillary butterflies can easily be identified as a group by the spots on the underside of the wings. The Great Spangled Fritillary is a northern species and probably the most common in New York. As the name implies, the Gulf Fritillary is a southern species with a small presence in the state. Growing violets, the larval host plant of many species, is an easy way to insure fritillary butterflies are n the back yard from season to season. 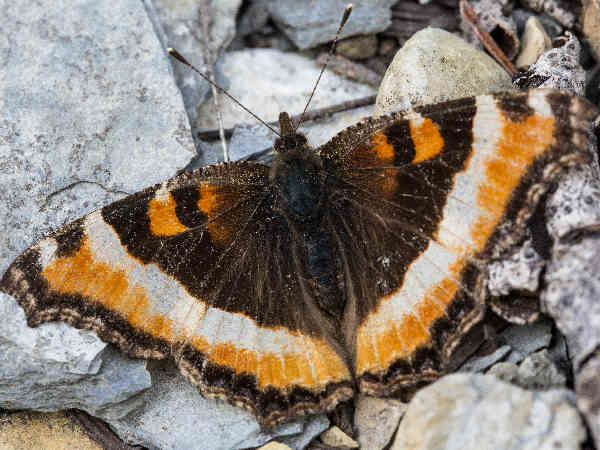 The picture shows a Milbert’s Tortoiseshell, a rather nice looking and widespread species. In the West, for example, it can be found as far north as Alaska and as far South as Arizona. 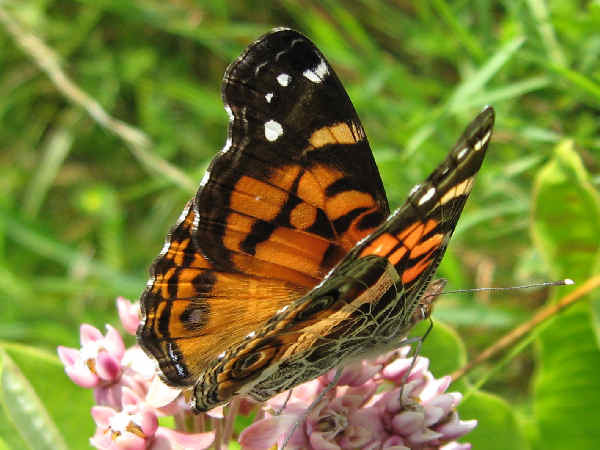 The Vanessa butterflies, Ladies and Red Admiral are migrating species like the Monarch. Every season they return to the south. As spring approaches they migrate north, sometimes in large numbers, for breeding. The picture shows a side view of an American Lady. Whether you are a tourist in the Big Apple or a New York resident from the north, Swallowtail butterflies are a fact of life. The nine listed species are indicative of a nice diversity. 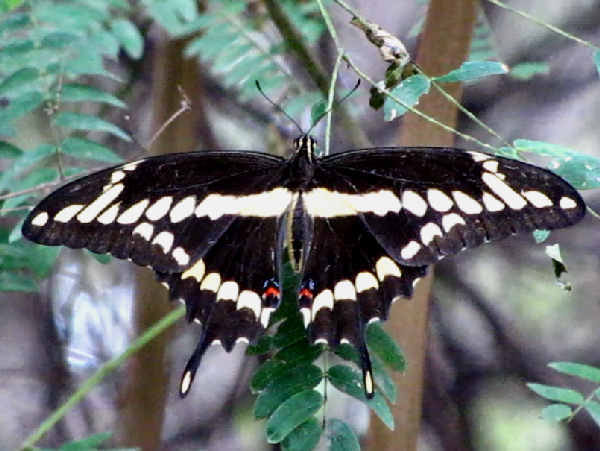 The picture shows a Giant Swallowtail, a not very common species. The Eastern Tiger Swallowtail has a state wide distribution. Also typical of East Coast butterflies is the Northern Metalmark as the sole species in the state.